Schemmer's President and CEO, Steve Kathol, P.E., S.E. 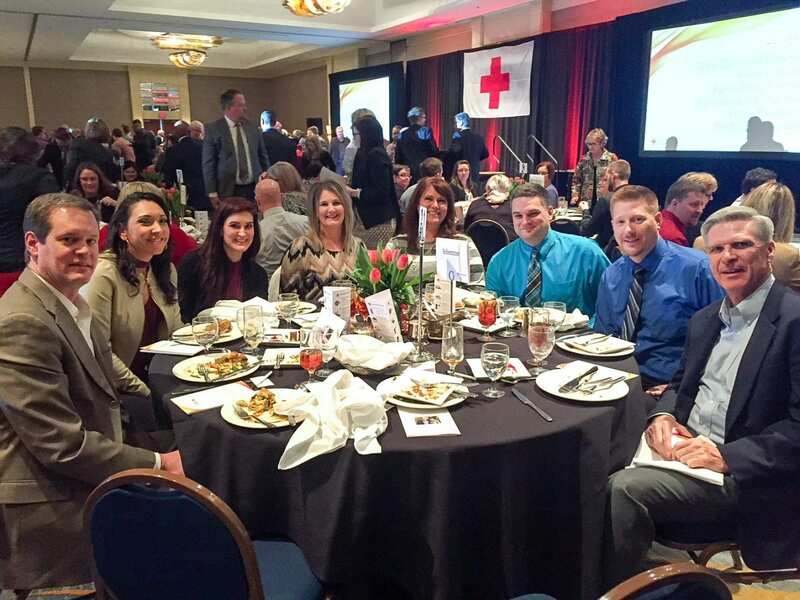 ; Tracy Mumford, LEED AP; Jason Heinze, P.E., S.E., LEED AP; Bart Pugh, CPSM; John Pluta; Dan Kerns, AIA; Jill Laferriere; Paula Latham; Michelle Westphalen and Kelly Gapinski were in attendance for the American Red Cross Heroes in the Heartland luncheon on Thursday, March 8, 2018. The program honored local heroes for their extraordinary efforts to better the lives of others. Malorie Maddox of WOWT and Emcee for the presentation of awards, recognized Jayger Haag for being a winner of the My Hero Essay Contest. Roland Burger won the Life Giver Hero award for giving over 29 gallons of blood in over 40 years. Bruce Froendt was awarded the Commitment to Community Hero award for starting the AllPlay Foundation, which brings sports and recreation to people with disabilities and mobility impairments. Evelyn McKnight is a cancer survivor who won the Call to Action Hero award for donating her malpractice award to establish Hepatitis Outbreaks' National Organization for Reform after contracting Hepatitis C through the reuse of syringes during chemotherapy. The Gift of Life Heroes awards were given to the Nebraska Medicine Kidney Transplant Team and nine individual Donors for organizing and participating in the state's largest living donor transplant chain. Mumford is on the Board of Directors for the American Red Cross in the Omaha Metro and Schemmer was a proud Table Sponsor at the event. From left to right: Steve Kathol, Michelle Westphalen, Kelly Gapinski, Jill Laferriere, Paula Latham, John Pluta, Dan Kerns and Bart Pugh.